Heavy-Duty Bariatric Walkers have reinforced heavy-duty frames with weight capacities up to 700-lbs, and the Bariatric Safety Roller Walker has a 1000-lb weight capacity. Bariatric walkers fold easily for transport or storage. Drive model 10220-1 Bariatric Walker is an oversize (wider & deeper frame design) Steel Folding Walker. 500-lb capacity, 20" between hand grips, 2-button release. Extra-Wide, Dual-Release, 600-lb weight capacity. Fits users 5'4" - 6'2" in height. Bariatric Dual-Release Push Button, model PB1090 with 500-lb weight capacity. Invacare Heavy-Duty Dual-Release Adult Paddle Walker, model 6291-HDA has 500-lb weight capacity. World's most popular heavy-duty walker. Bariatric Walker with 5" Front Wheels and Rear Glides Steel Folding Walker. 500-lb capacity, 20" between hand grips, 2-button release. Bariatric Folding Walker with 5" Dual-Wheels. 500-lb weight capacity. 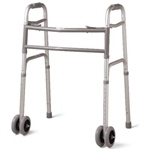 Sold by Case of 2 Walkers with Wheels, Extra-Wide, Dual-Release, 600-lb weight capacity. Fits users 5'4" - 6'2" in height. Heavy Duty Bariatric Walkers with weight capacities up to 1000-lbs.